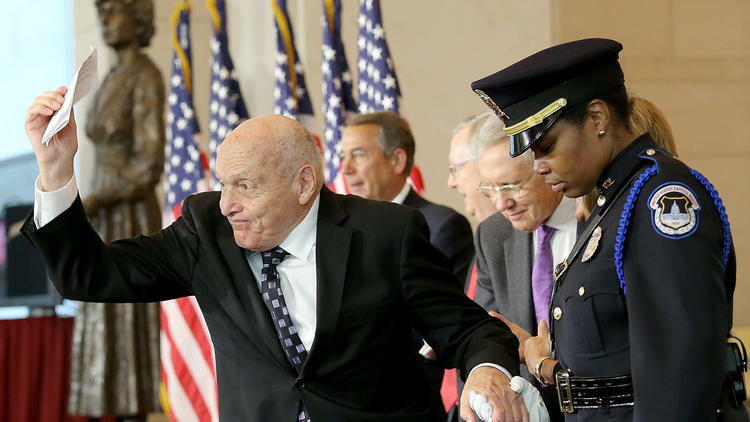 Harry Ettlinger, a subject of the "Monuments Men" book and movie, celebrates after receiving the Congressional Gold Medal on Thursday at the Capitol in Washington. The event honored the men and women who protected historical sites and recovered cultural artifacts during World War II. Before Richard Barancik was a successful Chicago architect, he helped safeguard some of Europe's most valuable pieces of Western culture plundered by the Nazis. Seventy years later, it remains difficult for him to fathom the theft of millions of paintings, sculptures, drawings, pieces of furniture and other objects at the close of World War II, detailed by Robert Edsel in his 2009 book, “The Monuments Men: Allied Heroes, Nazi Thieves, and the Greatest Treasure Hunt in History.” The book was made into a film by George Clooney. “All for their own selfish pursuit,” Barancik said on Thursday, before he and three of the surviving “Monuments Men” — Harry Ettlinger, Motoko Fujishiro Huthwaite and Bernard Taper — were honored with the Congressional Gold Medal, one of the nation's highest civilian awards. They were members of an Allied armies unit assigned to recover the works of art stolen from homes, museums, churches and elsewhere. The approximately 350 civilian soldiers — mostly middle-aged men and women who were historians, architects and museum personnel prior to the war — were part of the Monuments, Fine Arts and Archives section. According to Edsel, more than 5 million cultural objects were seized by Adolf Hitler and the Nazis. In May 2014, Congress voted overwhelmingly to award the Congressional Gold Medal to the unit for their heroic role in preserving works of cultural importance. Relatives of deceased Monuments Men also attended Thursday's bipartisan ceremony, along with members of Congress. “They are truly heroes,” said Rep. Kay Granger (R-Texas), who sponsored the bill awarding the medals. From Poland to France, priceless treasures were stolen as the Nazis occupied Europe. Many items were acquired from sales made under duress because of anti-Semitic laws, a process that continues to complicate restitution efforts. “They sought works reflecting Aryan genius, which in their view included Dutch and Flemish masters — Vermeer, Rembrandt, Van Eyck,” Elizabeth Campbell Karlsgodt, a historian at the University of Denver who has studied Nazi looting, said in an email. Hitler had planned to house the stolen art in a museum in his hometown of Linz, Austria. Ettlinger, who was born to a Jewish family in Germany before moving to New Jersey and being drafted by the Army, said the world should not forget that the spoils of war do not always belong to the victor.